At LANshack.com you will find the highest quality Datacom products on the market for the most critical networks. LANshack.com manufactures custom fiber optic and copper cable assemblies to make your installation as seamless and robust as possible. You will discover a huge selection of products creating a one-stop-shopping experience for your cable installation. LANshack's full spectrum of QuickTrex Custom Fiber Optic Patch Cables, Mode Conditioning Cables, and Pre-Terminated Fiber Assemblies are manufactured in the USA by highly trained technicians at the time of your order, are individually tested, and come with test results! Ready to pull Fiber Optic Pre-Terminated Assemblies are a great solution for Indoor, Indoor/Outdoor, and Outdoor Runs and are available in Singlemode and in Multimode 62.5/125 OM1, 50/125 OM2, and 50/125 OM3 cable types. The custom QuickTreX line of cables allows you to choose an exact type, length, and color of fiber or copper cabling. LANshack offers Cat 5 patch cables, Cat 6 patch cables, and Cat 6A patch cables in shielded and unshielded types. You can also choose from plenum or riser rated. If you are unsure about the type of cable needed for your job a sales representative is always available to take your call and offer assistance. Custom Network Installation Tool Kitsare also a great product if you are a Network Administrator, Low-voltage electrician, or any low-voltage cable installer and are looking for a premium tool kit. The QuickTreX line of tool kits offer everything you could ever need for your cable installation, with different sizes and designs to fit your cabling needs. These kits are assembled in the USA with the highest quality control. 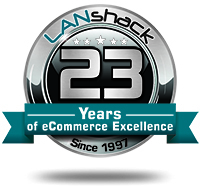 LANshack.com has been in business since 1997, and has always been an industry leader in product offerings, informational tutorials and videos. The wide range of informational tutorials and How-To Videos provide ample information for any level or skill set to understand more about fiber optic networks, copper cabling, and HDMI standards. LANshack.com offers special pricing to Government Agencies, State Agencies, Schools and Educational Facilities, and Resellers. This pricing can be obtained by applying through the link in the banner of the webpage, or by contacting a sales representative at sales@lanshack.com. The sales staff at LANshack is always happy to help with any questions whether they are technical or if you just need some more information about a product. We are open from 9AM-5PM EST and are always on hand for assistance.